President David J. Skorton if you value freedom and human liberty, tear down this fence. Cornell is suppose to be an institution of higher learning and not a eastern bloc prison camp. Hat tip photo: Rochester, NY, Democrat and Chronicle. 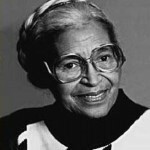 Today is the anniversary of the day that Rosa Parks made waves in Montgomery Alabama in 1955 by refusing to give up her seat on a bus to a white man. What Rosa did that day sparked a movement resulting from pressure that had been building for almost 100 years. African Americans, who had been freed from slavery by Abraham Lincoln, were forced to endure a century of contempt, disdain and abuse from white Americans. Our society, although founded by men who rejected the concept of social classes, was maintaining a dual class existence and legally forcing people of color to live a servile existence. By the power and grace of God, this finally changed in America as a result of the boycotts, rallies, legal wranglings, and efforts of the Federal Courts and finally Congress. Although one may believe strongly in the sovereignty of the states, clearly the rights of United States citizens was being abridged by the actions and/or inaction of many of those states, and the Federal government needed to act. When I contemplate these events, it always amazes me that human beings can be so incredibly dysfunctional. It certainly makes greater sense to me to see an individual here or there who is so stupid that they actually think they are superior to others. But to think that large swathes of our society would actually continue to look down on others because of a history that is over two generations old, and especially in a time following the horrors of Nazi Germany, that they could continue to look upon other humans as just wild cattle that had been let loose and whose status as free men and women had to be tolerated. How could our country reach this point?